"This is an exciting day for Angels fans and every player who has ever worn an Angels uniform," Angels owner Arte Moreno said. Mike Trout #27 poses for a portrait during Los Angeles Angels of Anaheim photo day on February 19, 2019 in Tempe, Arizona. Widely considered the greatest player of his generation, Mike Trout has likely secured the greatest contract in the history of North American professional sports. Trout, 27, has agreed to terms on a 12-year contract with the Los Angeles Angels, the team announced via social media on Wednesday. While the Angels didn't specify how much Trout would make, his 12-year contract was reportedly set to be worth $430 million, which would instantly take the top spot for a contract in the history of North American sports. 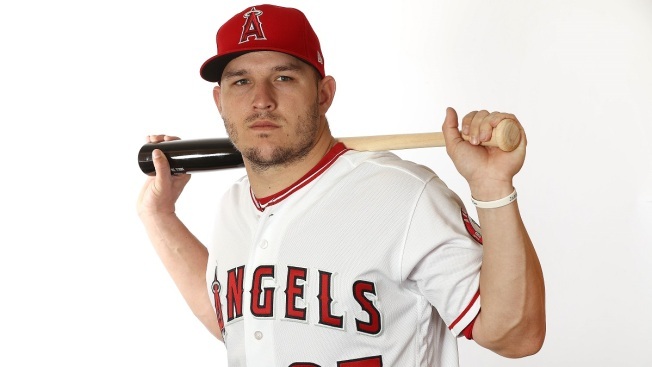 The seven-time All-Star, two-time American League Most Valuable Player and six-time Silver Slugger Award winner was drafted by the Angels 25th overall in the 2009 Major League Baseball Draft and will be under contract with the Angels until the age of 40. The right-handed center fielder made his MLB debut in 2011 and won the 2012 Rookie of the Year award for the American League. On average, Trout would earn an average of about $35.8 million per year under the reported figure, which would beat the previous MLB record for annual average of $34.4 million by former Dodgers' pitcher Zack Greinke. In total, the reported figure would top the Philadelphia Phillies' $330 million deal with Bryce Harper from earlier in March. In 2018, soccer players in Europe earned annual salaries that top Trout's reported deal, according to Forbes: Lionel Messi earned $84 million; Neymar earned $73 million; Cristiano Ronaldo earned $61 million in salary in the same year. Russell Westbrook in the NBA is signed to a five-year $205 million contract, which averages out to $41 million per year. While other players may earn more money on an annual basis, no other North American sports contract has ever been worth a figure that rivals $430 million. "This is an exciting day for Angels fans and every player who has ever worn an Angels uniform," Angels owner Arte Moreno said in a statement announcing the agreement. "Mike Trout, an athlete whose accomplishments have placed him among the greatest baseball players in the history of the game, has agreed to wear an Angels uniform for his entire career." "This is where I wanted to be all along," Trout said in the statement released by the team. "I have enjoyed my time as an Angel and look forward to representing the organization, my teammates and our fans for years to come. I want to thank Arte and Carole Moreno for their efforts. Their leadership and commitment to winning played a key role in my decision. Thanks also to my teammates, coaches, John Carpino, Billy Eppler and his Baseball Operations staff, the entire front office and Angels fans for all their support. It has made a tremendous difference not only for me, but for my family as well!" The Angels plan to hold a press conference at Angel Stadium on Sunday to discuss the signing.